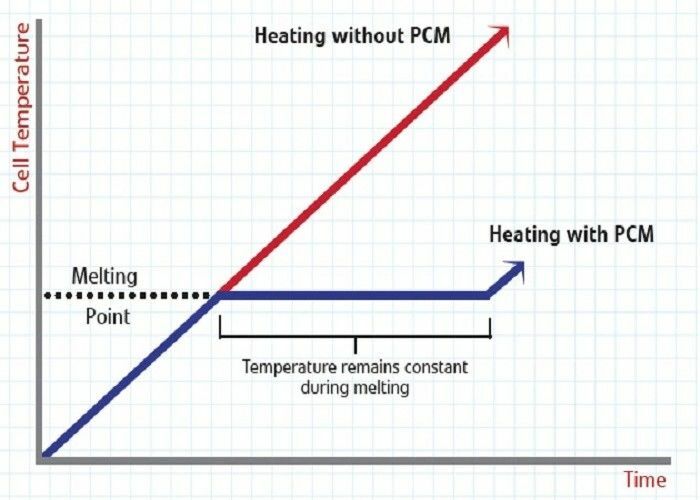 Phase Change Materials (PCMs) are ideal products for thermal management solutions. This is because they store and release thermal energy during the process of melting & freezing (changing from one phase to another). When such a material freezes, it releases large amounts of energy in the form of latent heat of fusion, or energy of crystallization. Conversely, when the material is melted, an equal amount of energy is absorbed from the immediate environment as it changes from solid to liquid. This property of PCMs can be used in a number of ways, such as thermal energy storage whereby heat or coolness can be stored from one process or period in time, and used at a later date or different location, for example in solar energy building. PCMs are also very useful in providing thermal barriers or insulation, for example in temperature controlled transport. PCM can also be incorporated in thermal regulation textiles to control temperature change. Due to the temperature of the outer space, the protection of astronauts, the spacecraft is very strict, ordinary material cannot adapt to bad conditions, therefore, need special materials for protection.The scientists developed the first phase change materials, makes the astronauts' clothing, capsule shell and other applications. The technology has been in a monopoly position. 2 Phase change material reference to architecture, is a revolutionary development in the construction field which can achieve energy saving 60~ 99%. 3.In the field of clothing, phase change materialswill be inserted in the fiber, phase change materials can greatly change the quality of people livewithout using any energy; can make ordinary clothes into micro air conditioning. 4 Traditional refrigeration equipment, such as air conditioner, refrigerator, cold storage, all use refrigeration compressor refrigeration technology, not onlypower consumption,but also environmental pollution. By phase change technology, it will replace the refrigeration compressor, and save energy more than 60%. 5 For communications, electric power equipment, phase change materials can save equipment cost more than 75%. In the field of communication, PCMs has been widely used in communication station room between the battery pack, make traditional year life of equipmentextended to four years or more. The packing methods and size can be customized. Especially PCM of 22℃ can replace dry ice. Compared with dry ice, it is more economic and has no transportation limitation, usually by air.